my take: don't tell my cousin joe that i really liked this book. a while back another cousin posted an FB query for a good beach read. joe suggested all things malcolm gladwell. i poo-poo-ed it. publicly. a beach read is a novel IMHO. then i read this for bookclub. oh, what fun! gladwell has an amazing curiosity and the time & resources to explore all his crazy notions. 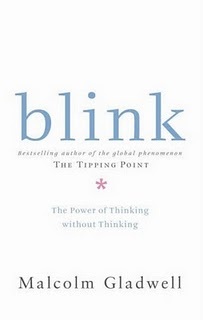 blink is about all the split second judgments, nuances, responses that we make. i read much of it out loud to hubby in bed (while he was trying to read something else). reading the gladwell books makes you feel interesting and smart. for a short while, i had all sorts of interesting facts to bestow on people at gatherings. the fact i keep sharing is the blind auditions chapter at the end of the book. currently, hubby is reading what the dog saw and won't stop talking about ketchup. it's on my summer reading list. maybe even at the beach. please don't mention it to joe. my recommend: i'm not going to say those looking for a beach read. as a matter of principle. we had a great discussion at book club.